The name of King Kulasekhara Alvar is well known to the followers of Srila Prabhupada. His Divine Grace used to relish with great ecstasy the Mukunda Mala Stotra written by this great saintly king. This stotra is commonly known in ISKCON as the Prayers of King Kulasekhara. Though his name is well known, for most devotees, very little is known about Maharaja Kulasekhara. We shall now try to remedy this lacuna by presenting a concise synopsis of his life. But before we start we must briefly answer the question– Who are the Alvars? The Alvars are 12 especially great devotees who appeared in South India. They are not ordinary jivas but are incarnations of the parshadas (paraphernalia) of Lord Sri Krsna. The Tamil word Alvar has the meaning “Drowned in God-love” or “Sunk deep in divine ecstasy.”[i] The Alvars all composed devotional songs, in praise of Lord Krsna and His Avataras. The vast majority of these compositions are in the Tamil language. They embody the highest philosophical knowledge of the science of God in all its nuances (namely sambhanda, abhideya, and prayojana) and are considered by the followers of the Sri Sampradaya (one of the four Vaisnava Sampradayas) to be as good as the Veda. This Tamil Veda of 4000 compositions is known as the Divya-prabandha. Thus, the acaryas of the Sri Sampradaya such as Natha-muni, Yamunacarya, Ramanujacarya, Vedantadesika, and Viraraghavacarya learnt not only the four Sanskrit Vedas but also the Tamil Veda–the Divya-prabandha. These 12 Alvars are thus of tremendous importance in the Sri Sampradaya. We note that according to the traditions of the Sri-Vaisnavas the Alvars appeared between 6200-4700 years ago, but modern scholars claim that they appeared around the 7th-9th century AD, about 1300-1100 years ago. We accept the Sri-Vaisnava tradition. After all, these same politically motivated scholars also claim that the Aryans “invaded” India in 1200 BC (1900 years after the events of the Mahabharata took place). That the tradition of Kali-yuga starting in 3102 BC is a myth, and thus the events of the Mahabharata and Ramayana which took place prior to this time are also myths. Thus, Lord Krsna and Lord Rama are also myths if we are to accept the mundane scholars. In general, the mundane scholars view the Vedic tradition as mythical and constantly try to shorten the Vedic time-line. We categorically reject the opinions of these Indologists. With that very brief introduction into the Alvars let us continue with the description of the life of Kulasekhara Alvar. Maharaja Kulasekhara was born into the royal family of the kingdom of Travancore (southern half of modern Kerala province in South West India). The rulers of the land did not own the kingdom, they were but vassals and ministers to the Lord, Who was the actual owner. The worshipable Deity of the King and people of Travancore was, and still is, Ananta-Padmanabha Swami[iv] (situated in modern Tiruvanantapuram near the Southern tip of India). The Kings of Travancore would come before the Lord at least twice per day and make obeisances to Sri Ananta-Padmanabha Swami. The King would then make his reports to the Lord of his daily administration of the country, of which he was but the trustee. (This tradition of the Maharaja of Travancore visiting Lord Ananta-Padmanabha Swami goes on to the present day even though the King has no real political power in the modern Republic of India.) Such was the pious and saintly quality of the ancient line of Vedic kings among whom Maharaja Kulasekhara appeared. The father of Kulasekhara Alvar, Dridha-vrata Maharaja, is said to have been childless, a very serious condition for a monarch. He intensely prayed and worshipped the Lord. After sometime Lord Narayana was pleased and benedicted him to have a saintly son. Shortly there-after in the 27th year of the age of Kali, that is 3075 BC, in the cyclic year of the Brhaspati Samvatsara[v] called Prabhava, in the Tamil month of Masi (equivalent to the Solar Month[vi] of Kumbha when the Sun is in the sign of Aquarius–presently from about Feb 13-March 15. ), when the Moon was in the Punarvasu naksatra[vii] (the same as Sri Rama, this has great meaning as the Saint’s life will show), in the city of Tiruvanjikkalam, of the Kolli Land (Kerala), and in the Chera Dynasty, appeared the child Kulasekhara, a spiritual spark of the Kaustuba Gem (Kaustuba-atma) which Lord Sri Krsna wears as a pendant on His neck[viii]. Prince Kulasekhara was educated in all the arts of war and government, as well as all other traditional learning from the four Vedas and Shadvedangas[ix], etc. Thus the child was trained to occupy the high station of King of the Sera dynasty. When his son came of age, Dridha-vrata installed Kulasekhara as the King and then the father retired to the forest to pursue undisturbed spiritual life as is recommended in the sastras for saintly kings. Kulasekhara was a ksatriya of great prowess and became King not only of the Sera land but also of the neighboring lands of the Pandyas and Cholas. His internal administration was flawless and characterized by virtue, justice, peace and happiness; the weak feeling strong and the strong weak. Under his keen eye (enhanced by an elaborate espionage network) and watchful care he nourished the people and was the personification of magnanimity. However, while it appeared that the King possessed so many good material qualities in abundance he, unfortunately, was in fact spiritually blind. King Kulasekhara, like every other man of the world, considered himself to be a self-governed, independent being, that is, not dependent or governed by God. Though a plenary portion of the holy Kaustuba-mani, King Kulasekhara played the part of worldly king given over to his senses. Being so blessed by the causeless mercy of the Lord, Kulasekhara would often go into ecstasies and have spiritual visions and deep realizations which he would record in the form of devotional songs. These songs became part of the divya-prabandha. He now saw everything with purified spiritual vision and developed a very strong sense of detachment. He also desired to travel to Srirangam and have darshan of Lord Ranga-natha Who lies on Ananta-sesa-naga and associate with the Lord’s Bhaktas. He would daily condemn his responsible worldly position as King and languish in spiritual misery crying ever hankering to go to the Holy Tirtha of Srirangam where he would settle down forever. Sometimes he would sigh, hankering to visit the Holy Shrine of Tirumalai and have darshan of Sri Venkatesvara Svami. He would sometimes sigh to go to another Tirtha, and another, and yet another, and at each place would settle down forever. Such was his state of mind, a sort of divine love-sickness had set in. Sri Rama was to Kulasekhara Alvar not some legend or mythological allegory, but rather none other than God incarnate on this earth, as the Savior of souls–the very Lord of Whom the scriptures spoke. Kulasekhara was so entranced in spiritual consciousness that he lived and breathed the pastimes of Sri Rama and felt them to be ever fresh and palpably present, as will be shortly seen. The secret party accordingly sped in advance unknown, of course, to the spiritually enthralled King, and wheeling round at some distance, met the King marching on at an angry pace, and broke to him the good news of Sri Rama’s glorious victory and happy meeting with His darling Consort. At hearing this the King’s joy was inexpressible. Of course, in his then mood of spiritual delirium, he believed their tale, and returned home with them. The daily recital of Ramayana to the King went on as usual; and every important event which was read, was celebrated with great ceremony, pomp and rejoicings, and taking the murti of Sri Rama (enshrined in his palace temple-room and elaborately worshipped daily) in procession through the streets of the city with great eclat; ending with sumptuous feasting of Sri Vaisnava brahmanas and spiritual aristocracy and with distribution of charity, etc. Knowing the peculiar temperament of the King, and his keen spiritual susceptibilities, which carried him to the bhava-stage of ecstatic love of God, the reader (King’s guru) of the Ramayana exercised caution. For he enlarged on those events of the life of Rama where Rama was happy; and only slightly touched, or slipped over such passages as treated of distress, fearing lest the King get excited and fired beyond the bounds of ordinary reason. As he raved in spiritual rapture, he rose, armed himself, bid his army march, and sallying forth to the sea-shore, looking towards Lanka, plunged into the water without a thought of the dire consequences which must follow from such apparently rash and reasonless acts. The ministers and others were overcome with anxiety and dread, and with great wonder in a stunned manner they anxiously watched the King’s movements. They were so dazed and confused that they were unable to even think how to advise him against his head-strong impulses, nor dare to move to prevent him from acting on those impulses. Since they could not think of anything to say or do at this critical juncture, they simply stared. As they stared, the King had already plunged into the sea, and was neck-deep in water, resolved to swim the vast stretch of ocean beyond, to reach the shores of Lanka. Thus saying, Sri Rama caught hold of His royal-servant, brought him safe to the shore, and accompanying him as far as the city vanished out of sight. The king who, previously, was daily sighing and pining to go to Srirangam and live there for ever, was now in earnest. He ordered preparations to be made for retiring and leaving his kingdom and join the Kingdom of God. With these thoughts the ministers hatched the following plan. Whenever the king let it be known that he was about to leave for Sriranga tirtha, the ministers had a group of Sri Vaisnavas come to the city hailing that they had come from one Holy Shrine or another. The king would thus postpone his journey on their account. The materialistically minded ministers found the saintly devotees to be a nuisance and were in a quandary about what to do. If they tried to wean the King from going to Srirangam, they had to suffer bringing the Godly devotees to the kingdom–but their numbers were becoming unmanageable; and if they tried to eradicate the root of the King’s divine ailment–the association of Viasnavas–the King would simply renounce his kingdom and depart. While brooding over this problem they struck upon what appeared to be a superb plan. “Supposing we could by some means calumniate these vile people in the King’s eye. Then he would certainly awake from his delusion of believing that these are godly men. If those whom the King thinks to be godly were truly proven to be ungodly then there is a good chance of reclaiming the King from his odd ways.” With these thoughts they contrived the following plan: The ministers would secretly arrange for the theft of a valuable necklace used to decorate the King’s personal beloved deity of Sri Rama. It would be missed and reported to the King. He would hold an inquiry. And who would be the felons? Surely those seemingly Godly folk, who are warders and guarders of the jewelry, the pujaris who daily worship the deity on the King’s behalf and are therefore constantly using the jewelry. “Listen! Oh you ministers, lovers of God are incapable of stealing. It is impossible that even the notion of vice enter into their thought, what to speak of the act. Behold! I can swear to what I say. To prove this truth of my conviction and prove the falsity of your accusations against these innocent devotees, let a vessel, with a live venomous cobra imprisoned in it be brought to me. I shall thrust my hand into it.” The command was immediately obeyed. Then before the assembled court the King said: “If these bhaktas are straight in thought, word and deed, I cannot be bit by this cobra; but if they are crooked, let it bite and kill me.” So saying he thrust his hand into the vessel of death, but withdrew it unharmed. The ministers were put to shame. They hung their heads. It was useless, they thought, to dodge and trifle with the King, who was too much for them. They fell at his feet, confessed their trick, brought the necklace and placed it before him in fear and respect. Maharaja Kulashekara pardoned them just as Rama had pardoned the vile Kakasura, the crow who had attacked Sita–for the King was Rama’s disciple–and bid them that from hence forward they be the servants of the Sri Vaisnavas. “No more will I dwell with these vile and scheming ministers”, the King thought to himself, “I am disgusted with them. Why only them? I am weary of the whole world. I would prefer to leap into fire than keep company with brutes who are turned away from God.” Thus determined, the saintly King Kuleshekara decided from that moment to give up his kingdom. He installed his son Dridhavrata (named after his grand father) onto the throne. Then accompanied by his daughter–who, it is recorded, was a divine amsa of Nila-devi[xiii]–went to his heart’s eternal hunger, the shrine of Srirangam. On arriving there he gave his daughter in marriage to Lord Ranganatha Himself and remained there for many years engaged in the service of the Lord and His devotees. He would, at intervals, undertake pilgrimages to other divya-deshas such as Tirupati, Ayodhya, and Chitrakutam, etc. In his last days King Kulashekara went to the shrine of Nammalvar at Tirunagari near present day Tinevelli. From there he went to the holy place called Brahmadesa Mannar-Koil and remained there for some time doing services to the presiding Deity, Raja-gopala-swami. There at the age of 67 he returned to the spiritual world. Govindacharya, Alkondavilli, 1982 (reprint), The Holy Lives of the Azhvars or Dravida Saints, Bombay: Anantacharya Indological Research Institute. [i] Govindacharya, p. 71[ii] An attendant of Visvaksena. Madhurakavi was the disciple of Nammalvar and was in a similar relationship in the spiritual world. [iii] The beginning of Kali yuga. [iv] This deity was visited by Lord Caitanya in His tour of South India, this is described in C.C. Madya-lila 9.241-242. [v] An approximately, sixty year cycle of time governed by the movement of Brhaspati–Jupiter five times around the zodiac. 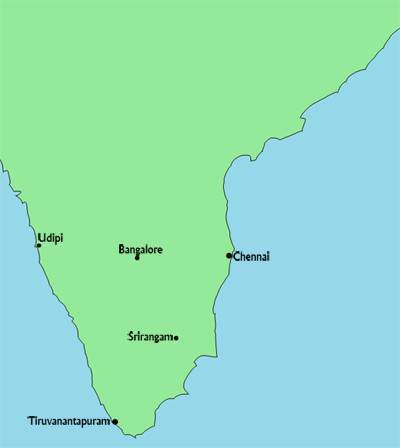 [vi] Kerala and Tamil Nadu follow Surya Masa—Solar Months—based on the transit of the Sun through the signs of the zodiac. But they still employ lunar calendar in other respects. [vii] Naksatra or Lunar Mansion is a division of the ecliptic (path of the Sun) into 27 parts and corresponds to region traversed by the Moon in one day, just a Sign of the zodiac corresponds to the region traversed by the Sun in one month. [viii] Divya-Suri-Carita 5.6. [ix] Six (shad) limbs (anga) of the Vedas. They are shiksha (pronunciation of Vedic phonemes), Chandas (prosody), Nirukta (etymology), Vykarana (grammar), Kalpana (rules for rituals and life style), and Jyotisa (astronomy/astrology). [x] Govindacharya, pp. 120-121. [xi] Govindacharya, p. 124. [xii] Govindacharya, p. 130. [xiii] Nila-devi, along with Sri-devi and Bhu-devi are the divine consorts of Lord Narayana. These Saktis of the Lord are also known as Samvit, Sandhini, and Hladini.